It's show time! May through September are very busy months for our marketing team. They will travel around the country (Jeff, around the world) to trade shows showcasing sprouted organic flour and telling thousands of folks and companies about the benefits of baking with sprouted flour. Pictured are photos of Jeff with customer Keith Guisto, Daniel, Leah, and Allison at the IDDBA (International Dairy, Deli, and Bakery Assoc.) show in Denver, June 1-3. Check out our web site for several new products: sprouted popcorn, navy beans, green peas, green pea flour, and sunflower seeds. We have also introduced 1-lb. bags of all of our products for everyone who has requested smaller amounts to try before purchasing larger sizes. Our 2-lb. bags are no longer available. You'll also notice new packaging for the 1- and 5-lb. packages. We excited about our new design. It "pops" on the store shelf and makes our brand easily identifiable. Our annual "INDEPENDENCE MONTH FREE SHIPPING CAMPAIGN" is right around the corner. From July 1st through July 31st we offer free shipping on orders of 15 pounds or more, any combination of our sprouted grains and flours (domestic orders only, one address per order). Just in time for 4th of July cookouts and picnics, I've included some fun cookie recipes and an easy summer berry/fruit cobbler that would all be great with homemade ice cream on a relaxing summer evening. As always, I've offered gluten-free options for each recipe. 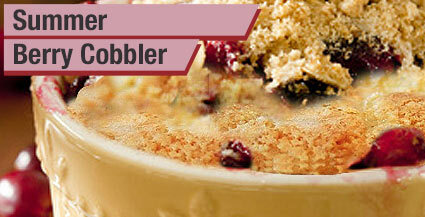 Great berry season cobbler. Or try sliced peaches with a dash of cinnamon instead of berries. 1. Preheat oven to 350 degrees. Grease a 9x13" glass or ceramic pan with butter. 2. In a medium bowl combine blueberries and 1/2 cup sucanat. Stir and set aside. 3. 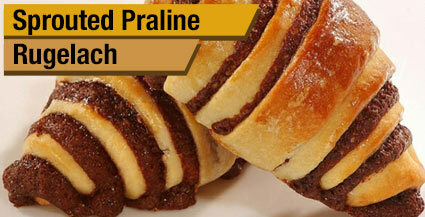 In another medium bowl combine 1 cup sucanat, sprouted flour, baking powder, and pinch of salt. 4. In large bowl beat butter with milk until smooth. Stir in flour mixture. Pour batter into greased pan. Scatter blueberries on top of batter. 5. Bake 35-40 minutes. Serve with homemade ice cream or freshly whipped cream. Great rolled cookies. Best to chill before baking to keep filling from melting out of dough. Makes about 4 dozen cookies. Beat cream cheese, softened butter, 1/4 cup sucanat, 1 teaspoon vanilla, and 1/2 teaspoon salt at medium speed in electric stand mixer 2-3 minutes until creamy. Gradually add flour, blending well. Divide dough into 4 equal portions flattening each into a disc. Wrap in plastic wrap and chill at least 2 hours. Stir together melted butter, next 3 ingredients, and remaining 1/2 cup sucanat, 2 teaspoons vanilla and 1/2 teaspoon sea salt. Remove from refrigerator and unwrap 1 dough disk and roll into a 10" circle (about 1/4" thick) on a lightly floured surface (silpats make great surfaces, too). Spread about 3 1/2 tablespoons butter mixture in a thin layer on dough circle, leaving a 1/2" border around edges. Sprinkle 1/2 cup pecans over butter mixture, pressing to adhere. Cut circle into 12 wedges and roll up wedges, starting at wide end. Place point sides down on a parchment-lined baking sheet. Chill at least 1/2 hour. Repeat procedure with remaining dough (one disc at a time), butter mixture, and pecans. Preheat oven to 350 degrees. Whisk together egg and 1 tablespoon water. Brush each roll with egg mixture. Bake for 15-20 minutes or until golden brown, switching baking sheets halfway through if baking 2 pans at a time. 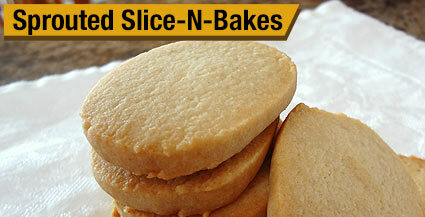 Cool cookies on baking sheets 10 minutes. Transfer to wire racks. Perfect dough to keep in freezer or frig for last-minute baking. Dough stores well in frig for one week, in freezer for one month. Makes about 5 dozen cookies. Beat first 5 ingredients at medium speed with an electric stand mixer 2-3 minutes until creamy. Add flour, blending well. Divide dough into 4 portions, shaping each portion into an 8x2" log. Wrap each in plastic wrap and refrigerate at least 1 hour. Whisk together egg and 1 tablespoon water. Unwrap logs, brush with beaten egg, and sprinkle muscovado sugar over logs (I put sugar on wax paper and roll logs in it), pressing slightly for sugar to adhere. Rewrap and chill logs at least 30 more minutes. Preheat oven to 350 degrees. Cut logs into 1/4" thick slices. Place 1" apart on 2 parchment-lined baking sheets. Bake 10-14 minutes or until edges are lightly browned, switching pans halfway through if baking at same time. Cool on baking sheets 5 minutes. Transfer to wire rack. Great with ice cream.